Discover the ingenious recipes and unrivalled attention to detail that made Pollen Street Social a name in the restaurant world, and follow the remarkable journey of a chef who took a risk to fulfil his dreams. Pollen Street Social is more than just a restaurant. Now, in this extraordinary book by the man who made it a reality, you will find out why. 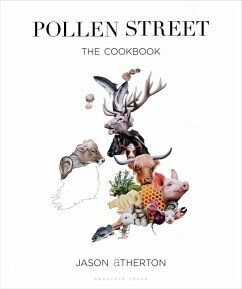 This stunning book showcases the very best recipes from the acclaimed Pollen Street Social, Jason Atherton's award-winning London restaurant. Opening in 2011, Pollen Street Social was awarded a coveted Michelin star just six months after opening, and the accolades and awards have continued ever since, and these pages highlight exactly why. The eponymous restaurant is famed for using the very best and freshest produce, and, following the seasons, Jason and his team take inspiration from the suppliers who put their heart and soul into producing the ingredients that form the dishes. With this focus on the importance of his suppliers running throughout, this book also details Jason's journey and his passion for every dish on the menu. The dishes featured range from canapés and afternoon tea to recipes such as Fruits of the Sea, Cartmel Valley Venison Loin and Pistachio Souffle, each of which is beautifully photographed by John Carey. Having worked under Pierre Koffmann, Nico Ladenis and Marco Pierre White, Jason Atherton ran Verre and Maze for Gordon Ramsay before opening his own incredible fine-dining empire. Jason's not only a world-class culinary alchemist, but also featured in national newspapers, magazines and TV series, most recently as the host of Great British Menu and My Kitchen Rules.